Mix wet ingredients together. Mix dry ingredients together. Mix them all together. Knead it a little on a floured surface, until you get a smooth dough. Let it rest in the fridge for 1/2 an hour, then roll out dough .5cm thickness (or thicker if you prefer) and shape. Bake at 190C for approximately 20 minutes, or until light golden. Cool and then dress appropriately. This entry was posted in Food Glorious Food and tagged food, ginger bread men, Photography, recipes by cityhippyfarmgirl. Bookmark the permalink. 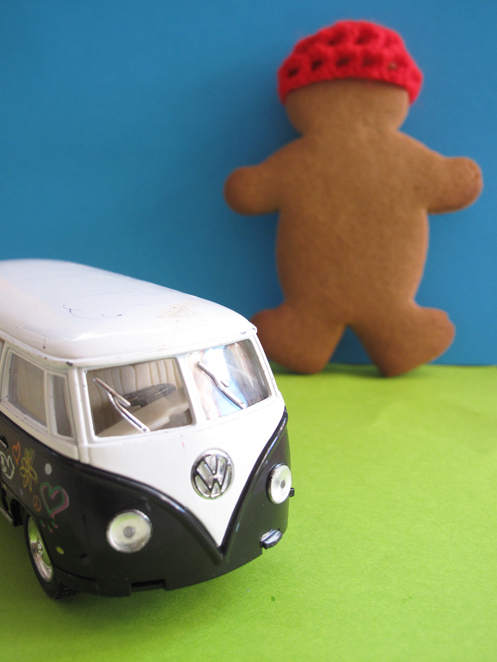 You should travel with Hippy Gingerbread man and take some photos of him out on the town. He seems so sophisticated. How they don’t just turn cannibal and gobble each other up I just don’t know. In any case I know they wouldn’t last a minute in my household…particularly that dapper one with the hat and scarf. He looks very jaunty with his scarf and cap. It is a pity he won’t last long. Yum! 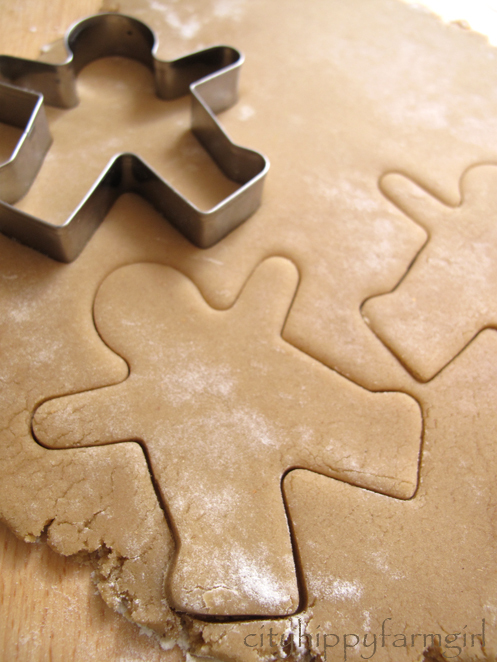 I have just been looking for a good cookie cutter recipe. I love the spices added. Too cute and too clever! Brydie – seriously gorgeous, whimsical photo’s! Brilliant! They are some seriously cool ginger bread peeps! Hey email me your address to kate@daylesfordorganics.com and I’ll pop some garlic in the post for you. These guys were too much fun to play with. At one point I did wonder why I was crocheting a hat and scarf for a gingerbread man, but then thought…hey, ’cause I can. I had to stop my self from setting up a lot more scenes for the little guy. The Monkeys thought he was a hoot! 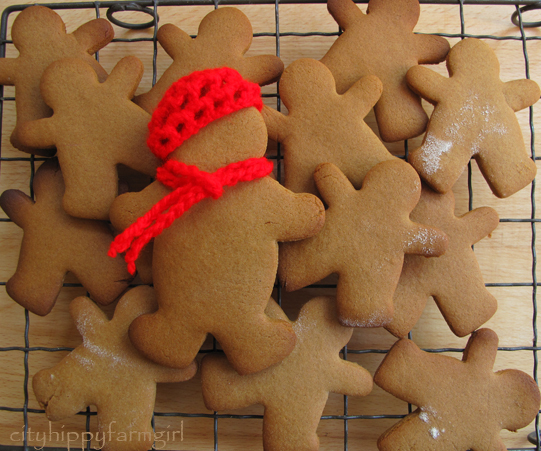 Love the gingerbread men – andthe one with his little scarf and hat LOL. I LOVE this! I decorate my gingerbread guys, too- but Have never thought to crochet (read knit, since I can’t crochet) a hat and scarf. So cute, Brydie! You’ve inspired me to step it up a notch! Can’t wait to see what you come up with Heidi 🙂 I’m still learning the whole crochet thing so these were practise runs. If you gave me one of these for Christmas it would make my day! Maybe too cute to eat though…haha! Have a terrific day! 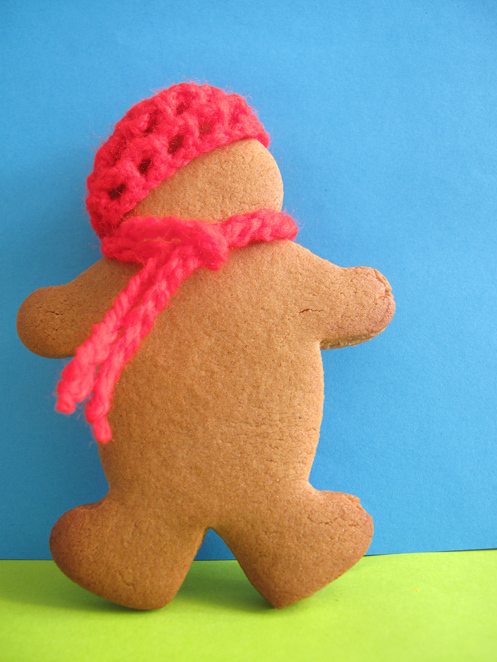 You’d make a fortune selling your gingerbread men complete with hat and scarf – gorgeous. Love the presentation 🙂 And the men themselves look pretty tasty too! Although I just realised that this was posted last year but somehow ended up in my Google Reader today?! Odd, but a nice surprise nonetheless!